The presidential candidate of the Action Democratic Party, Mathias Tsado, has stepped down from the race. He said he dropped his ambition in order to collaborate with the presidential candidate of the Peoples’ Trust, Gbenga Olawepo-Hashim. Tsado made his decision known during a joint press conference he addressed with Olawepo-Hashim in Abuja on Sunday. Calling on other candidates to join him in supporting Olawepo-Hashim, he said, “People of like minds have to come together. It is difficult for one person to achieve his ambition without people of like minds coming together. Olawepo-Hashim on his part said he was committed to building a better Nigeria. He dropped a hint that about 20 political parties would declare their support for him in the next few days. However, he did not disclose the names of the political parties. 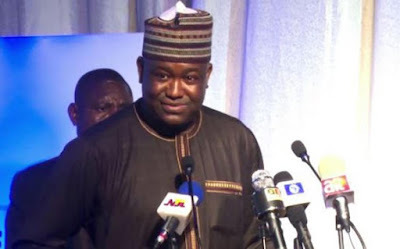 Olawepo-Hashim said, “I am committed to transforming Nigeria into a better country. About 20 political parties have signed up to this campaign and in the next few days, Nigerians will know who they are. “Nigeria is destined to be great. Things will start to happen. Nigeria will be great again. There was a time when this country was a pacesetter. The presidential candidate said that before uniting Nigeria, those who were seeking public offices must first unite. He said that with the cooperation of the political parties, his dream to have an effective political platform different from the ruling All Progressives Congress and the Peoples Democratic Party would become a reality.